a precision set of six punches ranging from 0.039″ thou to 0.160″ thou. Unfortunately they’ve been out of production for some time. You’ll take the clear plastic guide, and open the jaws to allow the plasticard you are using to go in between the pieces. You’ll need to work the guide open from both ends, slowly, otherwise it will bind up and you risk damaging it. When you have finished with the punches for that session wipe them down with something like 3-in-1 oil or something similar to prevent rust. They are tool steel after all. 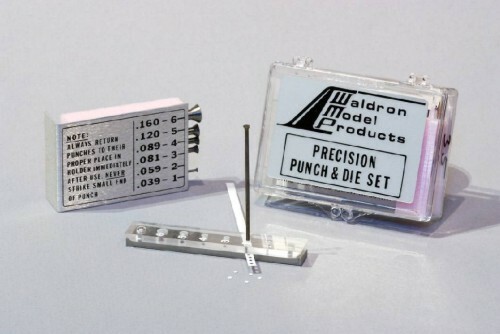 Unique Master Models sells a range of punch and dies sets including replacements for the sets mentioned here. The link will take you direct to the store page for punch and die sets. Another source is RPToolz who make several punch sets. Well worth a visit and I’ve heard good things about their products too.